Looking for the ultimate formula for measuring success? If you’re measuring the success of a fish by its ability to climb a tree, it’s going to fail at being a fish. Every time. In the same way, if a bicycle’s success is determined by the fact that it has wheels, you’re setting the bar too low. Ensuring you’re using the right metrics to measure your career success is crucial in reaching the goals that matter. It’s also essential that you record and monitor the critical numbers related to those metrics. 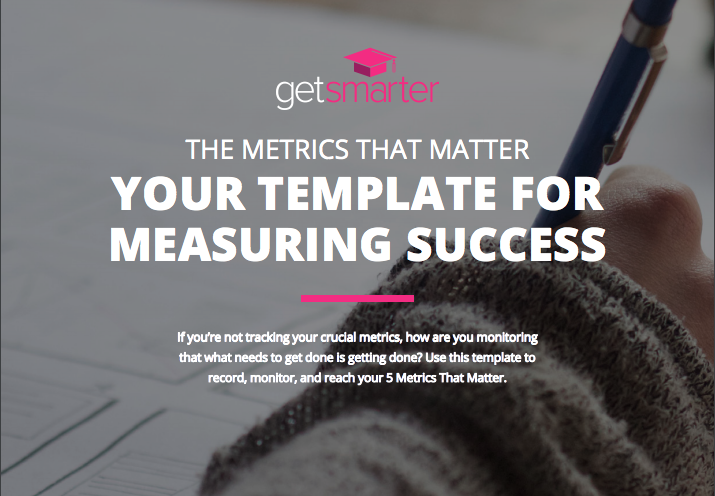 Measuring your progress not only holds you accountable and motivates you to work towards your goals, but also allows you to determine when you’ve reached them.With this in mind, we’ve created an interactive cheat sheet to help you record and monitor your five metrics that matter. Click the image below to download your template for measuring success. Want to become invaluable to your organisation with industry-specific knowledge and skills? Browse the GetSmarter course portfolio with over 60 online short courses designed to help you stand out.